Heat a large pot on medium to high heat. Once heated add the chopped bacon or oil. Sauté the bacon for several minutes until browned but not burned. Remove the bacon but leave the fat and add the chopped onion. 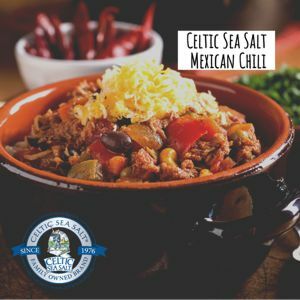 Sauté with a sprinkle of Kosher Celtic Sea Salt®. After a minute add the ground bison and break up into pieces. Brown the meat and add half the Mexican seasoning. Once the meat is almost fully cooked, add the chopped bell pepper and sauté for another few minutes. Add garlic, tomatoes, tomato sauce, kombu (for iodine and enhancement of flavor) and allow to simmer for 5 minutes. Add the beer, broth, all beans and rest of Mexican seasoning. Enjoy hot with a dollop of sour cream and fresh cilantro.